Parker”s MX80L Miniature Stage, the smallest linear servo-motor driven positioner in the industry, is redefining high throughput automation in the world of miniature positioners. The MX80 is a high performance linear servo motor stage designed to meet today”s 24/7 production demands requiring rapid-fire positioning of light loads within a small work envelope. For more information or to order your Parker MX80L Miniature Stage Series Linear Servo Motor contact Innovative-IDM at 877-906-2100 or send us an email at info@iidm.com. The Parker ET Series electric cylinders combine an unparalleled design with a variety of options that make it easy to integrate into both new and existing applications. Produced to hard metric ISO standards, the ET Series can mount into existing fluidpower cylinder applications, adding infinite programmability to the durability and long life expected of hydraulic and pneumatic cylinders. Combined with a Parker Hannifin motor and control system, the ET Series arrives at the customer”s dock complete and ready to mount. To check out more Parker products click here. Let Innovative-IDM help you with getting all your Parker products. You can contact us by phone at 877-906-2100 or email us at info@iidm.com. Watch this video on adding terminals. Click here to see more WAGO information, and let Innovative-IDM help you get all your WAGO parts. Give us a call at 877-906-2100 or send an email to info@iidm.com. The ZB Series Compact Vacuum Unit is an All-In-One solution to your vacuum needs. 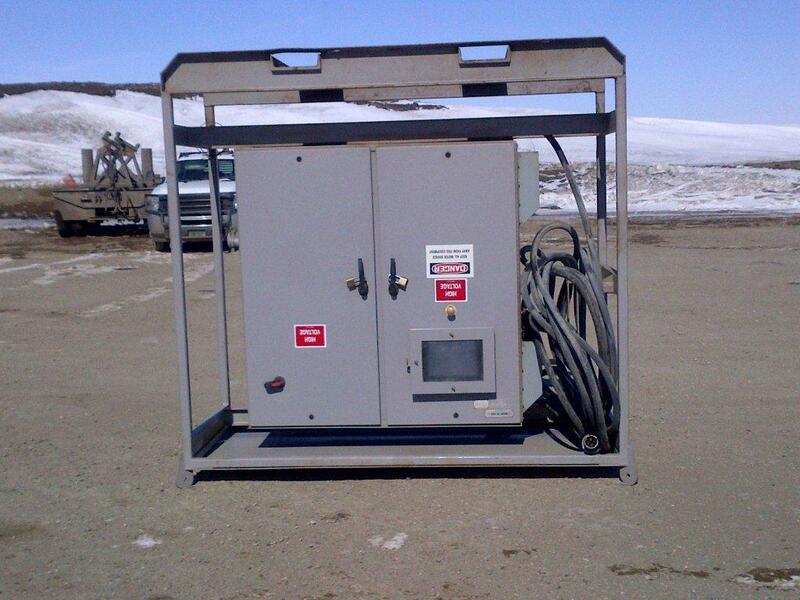 The unit includes a vacuum ejector, supply valve, release valve, vacuum break flow adjustment needle, suction filter and silencer in a single unit. The ZB is an energy saving design with reduced air consumption and reaches vacuum pressure set point quicker than previous models. 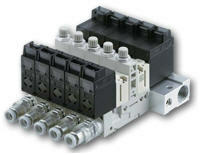 The ZB can be used as a single unit or mounted to a manifold of up to 12 stations. Industrial Panel Fell from Semi Truck: What’s That Look Like? We had a loader operator flip one of our newer Innovative-IDM panels off of a semi truck a few days ago. Can you send me a quote for a complete set of VFD’s and a recommendation that we change them out due to the shock that they would have incurred while being knocked off of a semi truck? BTW you should be very proud of how well this panel held up. I have seen a lot of panels dropped in the past few years and none of them came away with anywhere near this minimal amount of damage. This will be hands-on programming training on the A1000 drive. All drives, motors, equipment is provided, as is lunch. 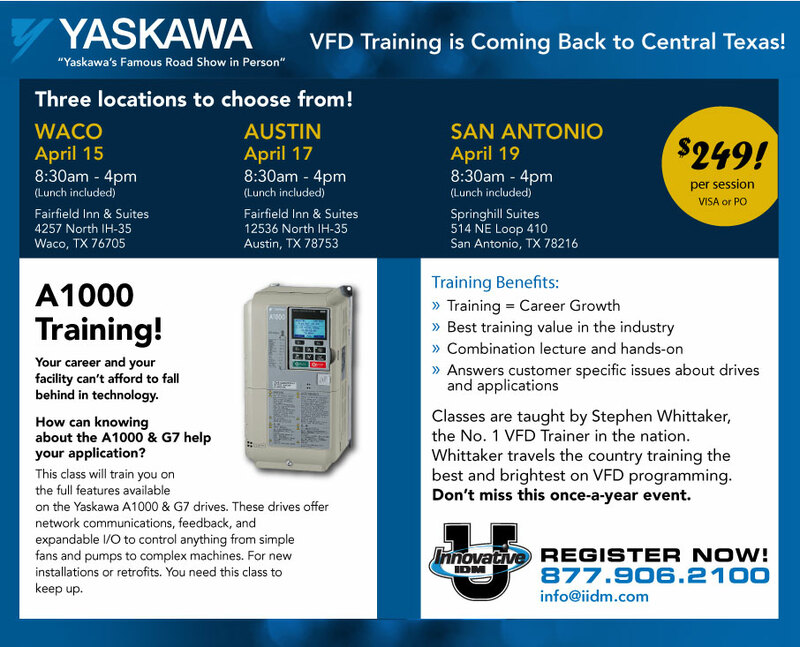 If you’ve been planning to send one of your employees (or yourself) to the YASKAWA VFD Training, please act now.Reserve your seat for a full day of A1000 training from the nation’s busiest VFD trainer, Stephen Whittaker of Yaskawa Electric USA. Just give us a call at 877.906.2100 or email us at info@iidm.com to reserve your seat today. 85 Fans, 19 pumps, 112 VFDs. There’s a ton of this kind of information on our Knowledge Center, including case studies, white papers, documents, automation software and videos, and more.